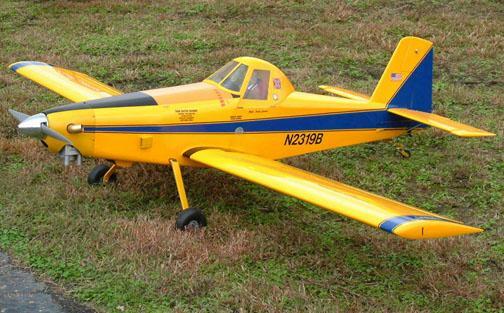 The AT502B-100 was the first scale model for Teamduster which was test flown in early 2003. The model pictured below now has over 400 flights, and is still performing well. This page is an introduction to the AT502B-100. As you scroll down you can view many photos of the 100 at flyins, air shows, and on display. There are also quite a few construction photos which were taken from the Photo CD, which is provided with each kit purchase. See Contact us and Links page for links, and contact information for the suppliers who provide the... Cowling, Canopy, Wingtube, Landing Gear, and a wood Completion Packages. SHORT KIT INCLUDES: Fuselage Formers, Wing Ribs, Flap Ribs, Aileron Ribs, Fin Ribs,Stab Ribs, and Rudder Ribs. Plywood Side Panel Doublers, Plywood Rear Side Doublers, Firewall, Fin Posts, Ply Instrument panel, Rudder and Fin Top pieces. Plywood side Doublers contain holes for Wing Tube, Wire Tubes, Wing Bolts, and Wing Dowels which automatically set wing incidence. R1 Root Ribs contain same hole pattern for "no error" in wing alignment. The Video below is a short segment of Bobby Wilkinson's Test Flight with his Teamduster AT502B-100. The plane is pictured on the website in several places, and is one of the best we have seen. The color scheme is AG-style, but the colors are more representative of the Fire Boss.